KMLMapServer turns your UMN MapServer installation in a flexible KML vector and raster data server. 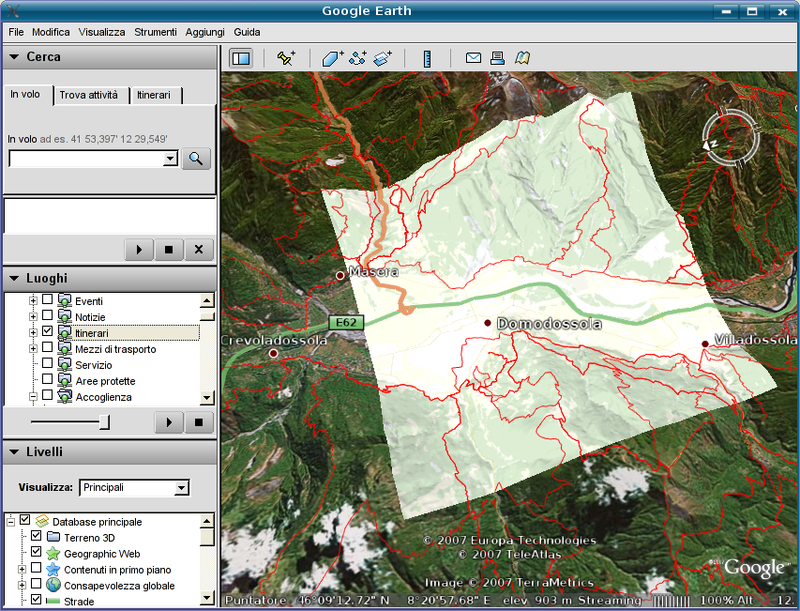 Dynamically serve your MapServer data straight into Google Earth. The goal of this project is to add KML output capabilities to any running MapServer installation. It will run out-of-the-box with zero or minimal configuration. Basically you just install this package somewhere under you web server root and it will work without any configuration. Configuration, if needed, is done through metadata in the MapServer’s mapfile, so you don’t have any other configuration files to worry about. This project comes from a simple idea: while we already have quite a few running MapServer installations, most of them are related to mountain hiking and trekking. A 3-dimensional view of the territory can bring a significative advantage while planning your holidays in the mountains. So we decided to start this project, in order to display our paths and tracks data in a 3D view using Google Earth. KMLMapServer was designed with OGC webservices in mind, when possible, the parameter names and meaning are the same as in WFS OGC service, and you normally call KMLMapServer with CGI-style parameters passed on the URL. A typical call would be: http://www.myserver.com/kmlservice.php?map=/maps/mapfile.map&typename=roads,rivers In this example the layers “roads” and “rivers” from mapfile /maps/mapfile.map are sent to the browser. Note that you don’t need to specify the layer name(s), you can also get a KML with all the layers in the mapfile, in this case the layers will be served as a folder of Network Links. The icon server is an independent package that creates PNG images of the symbols used for point layers. It is called through the same endpoint of the main service, the request type is “icon”. See the image for some example symbols how they appear in the table of contents (click to enlarge). To take fully advantage of some of these feature, additional configuration could be required. KMLMapServer re-use most of existing OGC metadata taken from the LAYER section of the mafile, and define a few of its own. None of them are required, but if you want to serve rasters you already need them in order to have a working WMS MapServer installation. Note for rasters: add EPSG:4326 to WMS_SRS metadata on all mapfile layers, otherwise WMS will not work with Google Earth. BALLOON_TEMPLATE Custom balloon (tooltip) template Vector If present, this is used to build the tooltip. HTML formatting is possible, $[name] ans $[description] are substituted. Licence: AGPL. Additional services such as installation, configuration, testing, trouble-shooting and assistance are available at highly competitive price. Feel free to contact us about KMLMapServer: go to contact page. I am very happy to see this utility. I was really looking for such a utility since a long time. At presently i was testing it but it gives the below errors please can you help me. Those are trivial php errors. Your installation is plain broken. Either you moved the classes folder after unpacking or have wrong permissions on ‘classes’ folder or its files. Thank you very much, its working fine now. The folder was moved. Ciao, non se scribere molto bene in italiano ma poso leggere. Per cuesto adesso scribo in spagnolo. Escusatemi. Estimados, quisiera saber como debo instalar esta aplicacion, tengo intalado mapserver y ya descargue de aqui http://sourceforge.net/projects/kmlmapserver/ el kmlmapserver. Ahora estoy a la deriva, ayuda please. How do i install application on existing map server. I got pretty happy since I’ve found your website. KML’s great!!! I’d like to give it a try and to do so I’ve installed KML Mapserver service under MS4W package – http://www.maptools.org/ms4w/index.phtml. However, I don’t have any valid mapfile example to see how it works with Google Earth. I wanted to see examples of how the layers need to be set in order to access Google Earth’s Services. Congratulations! I look forward to read your answer. I’m not sure about how to help you. KML MapServer should work without any particular layer setup with most common layer types (point, line, polygon and raster). Just keep in mind that, in order to work, KML MapServer needs a working mapserver and php_mapscript installation, and a working mapfile. Before trying KML mapserver make sure your mapfile is working correctly. Hi, thanks for your prompt answer. I’m not sure if was clear enough. I was thinking KML Service would help to bring together maps retrived by regular layers (described in the mapserver mapfile) and “special” layers (also described in mapserver mapfile) that would retrived data+maps from Google Earth. So, through the same mapfile I’d be able to see maps rendered by local layers + Google’s layers without any other direct implementation to access Google’s API. Did I get it wrong or this is it? I have some experience with mapserver but I was wondering if there was something that could help me to bring Google’s maps into my application without changing the front-end a lot. No, KML MapServer is about serving KML from standard MapServer layers, you can also see it as translator layer between mapserver and google earth that adds KML output to mapserver. If there is something in the docs that could be misleading regarding what KML MapServer does, please let me know (I’m not an English speaker, so forgive me if I was not clear enough). Regarding your last point, I think that openlayers let you bring together several map providers (like google maps) in a single webgis 2D interface. Thanks, you helped me indeed. Anyway I’m gonna take a deeper look at the docs and see if it serves my purpose. As I said I’m looking for something that brings Mapserver’s layers + Google’s layers (Earth and/or Maps) together using me same application without having to change it. By the way, your english is quite good. Thanks a lot. Hi Alessandro. I ‘ve played a lot with your kmlservice. Thanks a lot, it’s very usefull to publish easyly information in GE from Mapserver. I have a problem and perhap’s you can help me. so the minus has desapeared ! (only the first point x coordinate is concerned). It sounds like a bug. I uploaded a fix, would you please test the latest SVN version and report? I always got error message below. Is there anyone know what it is? kmlservice.php has 29 lines, your error is probably not related with kmlmapserver. Now I see. I downloaded the code from SVN. the file structure is as below. I am not familiar with PHP but I am trying to setup this service in my current working MapServer. So the above files/folders where I should put? I guess it is under ms4w/Apache/php, is that correct? Is there anythink I should look into? yes, as stated in the README, you just put the folder tree under your document root and it should work. For generic help on PHP please refer to the thousands of forums and discussion boards available on the net. BTW we are available for commercial support in case you need it. I got error message below. I am sure I have php_mapscript.dll in that folder….sorry to bother you…. Please contact the server administrator, admin@local.domain and inform them of the time the error occurred, and anything you might have done that may have caused the error. hey it was a simple PHP issue, thanks for developing this works perfectly! sono un neofita del mondo mapserver, ma sono interessato al kmlmapserver. Ho installato ms4w w il pacchetto kmlmapserver, ma non trovo un esempio di map file da seguire. Potete mandarmi un esempio di map file ? 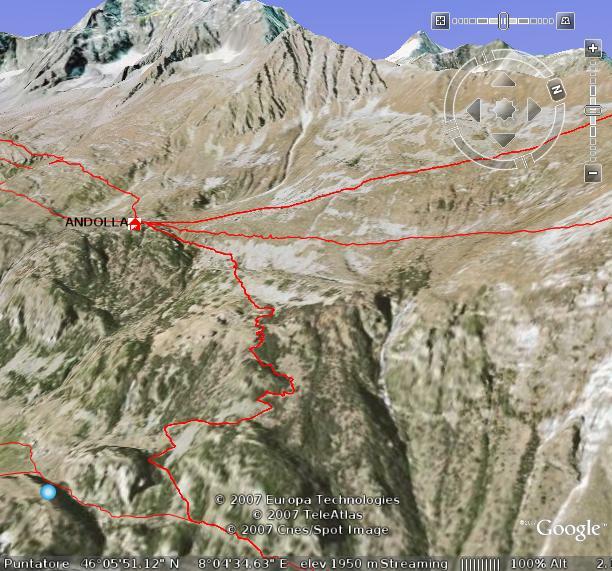 Ho caricato un map file, che funziona con gmap, ora non riesco a vederlo con kmlmapserver. Non capisco cosa manca ? <! 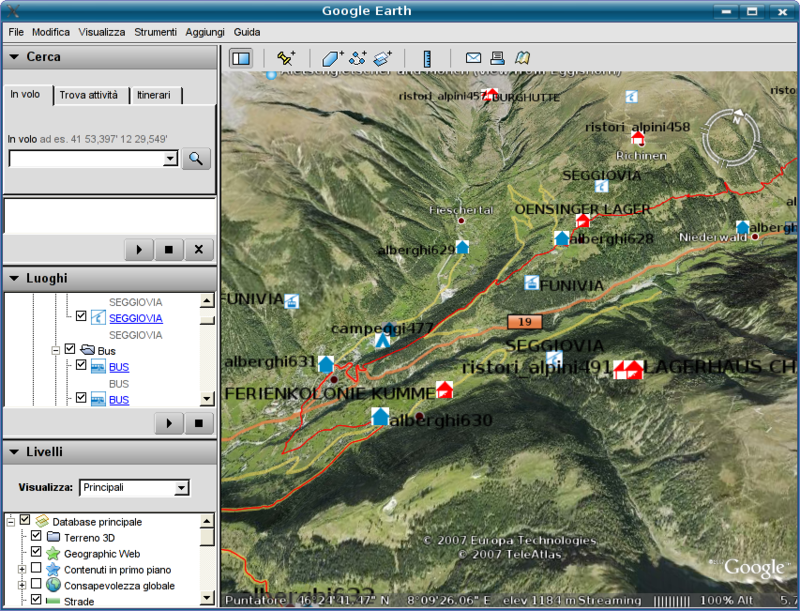 [CDATA[Geoservice du Systeme d’Information du Territoire Ticino. # Sample map file for a chameleon app. # of the drive where the .MAP file resides. Per il supporto commerciale (a pagamento), contattaci via email. Non si tratta di supporto commerciale, è una semplice domanda, se non vi va di rispondere prendo nota e cambio direzione. Ho mandato l’esempio visto che voi di esempi non ne date. non si tratta di “ci va” o non “ci va” di rispondere, kmlmapserver è open source e gratuito, il supporto invece si paga. Se avesse letto la documentazione si sarebbe accorto che con le limitazioni indicate, kmapserver lavora con qualsiasi mapfile “out-of-the-box” quindi senza nessun particolare accorgimento a parte quelli indicati. Per i dettagli e gli esempi sui mapfile, non è a noi che deve chiedere ma semmai alle innumerevoli liste che si occupano di mapserver. I’m a student in Master PRO specialised in GIS: Master SIGMA from Toulouse. I’am actualy on my training period where i’am working on a Web GIS application. 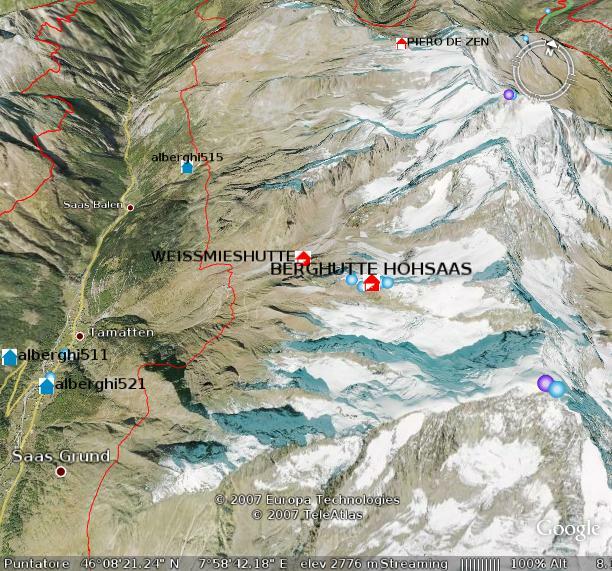 My data base are based on postgresql/postgis and my webserveur is naturally Mapserveur. I have develop a map file using pmapper environment and I would like to put my data on G.Earth or G.Maps with your kmlservice. I have a problem and perhaps you can help me. I have make my map file using your indication but when I make the URL I’ve got a doc.KML without informations, just an info windows with the name of the layer insert on the URL. If you don’t mind i could make for you the French traduction for your web page and develop a tutorial. I want to use it into C# asp.net.Is it possible.If it is possible?I am developing Mapserver with C#.I want to use KML.If it is possible Please guide me. I am waiting for your gret response. kmlmapserver is developed in PHP language. KML-Map-server simply returns all items within the source layer source ignorting the class expression. your statement is not true: kmlmapserver takes into account *only* regexes in class expressions (with some known limitation as written in the article and in the README). Congrats for good thought and efforts for mapserver users. I have configured on my local system. I have multiple Apache servers running on it. I use Port 84 for the MS4W application. I am using UTM coordinates and not decimal, degrees for my mapserver. Problems I face as follows. 2. I am unable to see my line (Proposed Route) as per my shape file on the google earth. I use ms4w for some time, I am very interested in the kmlmapserver, however after I release the kmlmapserver package and place it under ms4w\Apache\htdocs, and call the url “http://localhost/kmlmapserver-0.5/kmlservice.php?map=/ms4w/apps/ms_ogc_workshop/service/zz.map&typename=provincelocal” there is a http 500 erro, and a popup dialoge box says”CGI/FastCGI”problem, I do not know why. Congratulations on building such an easy tool. I have placed field values in my RESULT_FIELDS and DESCRIPTION_TEMPLATE, but cannot figure out a way to include field values in my balloon templates. Is this possible? My WFS response (with XML) got whacked when the form was submitted. The point was that there is a field called “CONFIRMED_DEATHS” coming from the WFS feed. You need to put “%” fields in DESCRIPTION_TEMPLATE, then put $[description] somewhere in BALLOON_TEMPLATE, kmlmapserver will first substitute “%” fields in DESCRIPTION_TEMPLATE, then substitute $[description] in BALLOON_TEMPLATE with the results of the first substitution. I’m trying to use your KML Map Server class. The return is an XML file with all the objects inside. But when I use in Google Earth the server icon is always red. Like he can’t dynamically load the XML. Sorry if I’m too rude, but your question indicates such a low knowledge of the web and it services that I strongly suggest you to hire a professional or to invest some more time studying. I want to use KML Mapserver but I need to control the file name generated by KML Mapserver. By default, the file name is doc.kml (or doc.kmz). Is there an hidden parameter for that 😉 ? Thank you for this component ! no, you need to modify the code and add a new metadata and parameter for the file name. Not an easy job though. Thank you for your answer Alessandro. I added a parameter “kmxfilename”, I changed get_request () to read it and I changed send_header () and send_stream (). I try to use kmlmapserver with GoogleEarth v5.1. I still work with Google v4.2, but I have troubles with the last version. Polygons are not correct and points are not correctly represented (all points have the same coordinates). Have you heared about changes in KML specifications that could append with kmlmapserver ? yes we have indeed had some problems due to a KML spec change (KML parser has become more strict), we have done some changes in our other internal libraries but we didn’t find the time to fix kmlmapserver. I received a patched version three days ago but I don’t know if this version fixes your problem, if you have time to work on this issue and if you are willing to commit back your findings I could send it to you for testing. Also: are you sure the problem is not in your Google Earth build ? I’ve observed a similar issue under a 64bit linux distribution and it was just a library problem. The problems seems to be identified. Only Linux google earth version are affected. Well, this problem only affects linux google earth 5.1 version. Thats a very fine application,thanks. I am using Mapserver data from a postgis database.When i use the script it servers a doc.kmz file alright but opening it in google earth it seems there is no data inside.The file is 4kb. Could anyone please give me a hint on what could be the problem. Hi there, I’ve got a working MapServer installation with both WMS and WFS running happily. I’ve installed KMLMapServer and it’s serving files. Which is great! However, the files only contain the layer names and not any data. I see a couple of other people are experiencing the same issue. Has anyone worked this one out yet? Is there any chance someone who has a working installation could post their map file? Since the development of kmlmapserver mapfiles syntax has changed slightly, this is probably the reason why kmlmapserver does not very well with latest mapserver. And to tell you the truth, we will probably not invest much more time in this project. The idea behind kmlmapserver was to have something at hand while a true KML support was being integrated into mapserver core. This did not happen so far. Unfortunately, we have not any paying customer to fund the development of kmlmapserver and we did don’t receive any donation until now. If anybody has a budget available to invest on further tests and development on kmlmapserver, we would be happy to continue our work on this project.